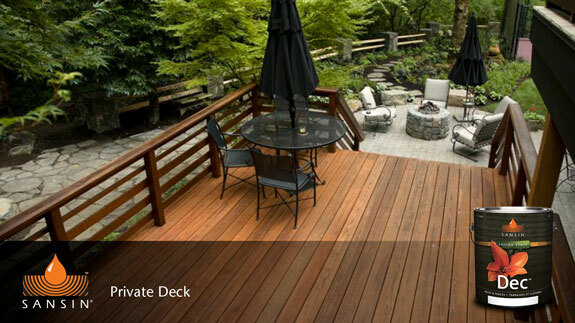 Sansin DEC Finish is a two-coat, specially designed formulation for decks and balconies. The modified natural oils in Sansin DEC Finish penetrate deep into the wood with the kind of variable moisture content frequently found in decks. Although high in solids, the Sansin DEC Finish formula does not leave a thick film on the surface but remains breathable and easy to maintain. Provides excellent UV and weather protection and will not crack, peel, or blister. 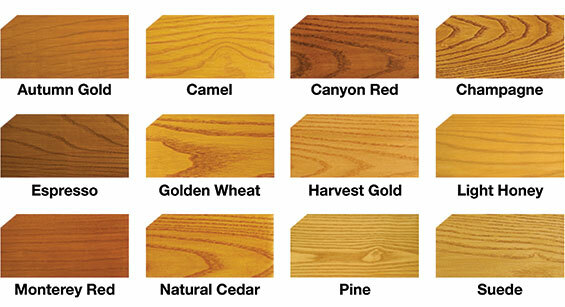 It is the natural solution for maintaining the beautiful aesthetics found in wood. For users of Sansin PTL, recoat with Sansin DEC. Sansin DEC is compatible with "green" wood (up to 25% moisture content). Made in Canada. Application Temperature: 60°F to 80°F. Apply in the early morning, late evening, or in shade of day. Do not apply in heat of day, direct sunlight, or if surface is warm to the touch, this will cause a surface film that may cause peeling later. It will be necessary to lightly mist with water after application in temperatures above 70°F. Allow adequate time between applications. A minimum of 24 hours in proper drying conditions. Coverage: 100-200 sq. ft. per gal. Storage: Store between 50° F and 86° F - Do not freeze.